With the notion that parts of Ireland can be characterized as constituents of the national beverage (water, hops, yeast, cork, etc. 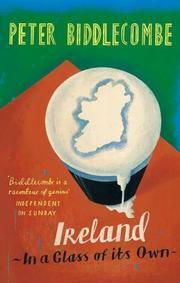 ), a half-Irish, half-befuddled travel-writer tipples his way through every Hibernian county. From Kerry to Derry, from Down to Offaly, it’s really a long way to Tipperary and, ultimately, to County Clare, childhood home of Biddlecombe (The United Burger States of America, 2003). In each of the 32 counties he visits on his sentimental journey, the favored drink is Guinness. Indeed, the ubiquity of the favored black stuff makes this a kind of record book of Guinness. Local lore is gleaned from interviews with the likes of an “old blattereen with a flat cap and a clay pipe,” “a doddery old kluk,” “an old bluggy earwagger” and, improbably, some “old shlimazls.” Along the way, there are farmers, publicans, servant girls, lords, lunkheads, wits. Biddlecombe visits St. Doologue’s Church (the world’s smallest parish) and the Coast of Co. Donegal (where, it’s reported, “the girls have the Pope’s permission to wear the fat end of their legs below the knee”). Castles, kegs, kings and cattle share the pages with Yeats, Wilde, Nora Barnacle and The Troubles in this Riverdance of words. Almost every chapter is adorned with a joke. And he doesn’t mind a bit more of the black stuff, if you please, as Biddlecombe turns snarky with a plenitude of snotty remarks about all things American. Maybe it’s just the Guinness, but the truth is he’s no Myles na Gopaleen, or even the late Flann O’Brien, when it come to funny Irishmen. A mildly witty book that goes on a wee bit too long—several hundred pages too long. Paddywhackery, blarney and a bit of the black stuff.